Metallic Mandy and Chris Hanson scored 220 points on Wednesday to win the NCHA Futurity John Deere Open Limited, while Metallic Moon and Gabe Reynolds claimed reserve with 217.5 points. “I knew we had a good horse,” said Hanson, who showed Metallic Mandy, by Metallic Cat, for John and Hope Mitchell, Weatherford, Tex. “She’d been good through the go-rounds and was good in the Non-Pro. 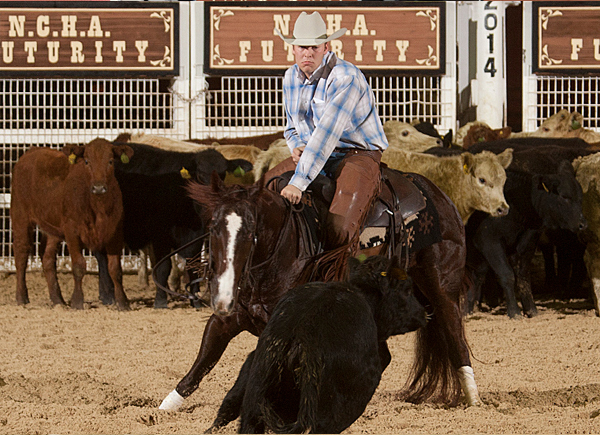 Going into Thursday’s second day of Non-Pro second go-round competition, Hope Mitchell, reserve champion of the 2008 NCHA Non-Pro Futurity aboard Lannies Freckles, is the leader with 433.5 points on Ms April Cat, by Cat N A Hat, and also a second go-round contender on Metallic Mandy. Hanson also came close to another 220-point run in the John Deere Finals on Little Too Sly, but lost his relentless second cow, with no time for a third cut. Even so, he was awarded 205 points. “I knew on (Little Too Sly) that I could have a good run,” said Hanson. “We had a good first cow and spent a lot of time getting our second cow set up and cut right. That cow was good for a bit, but then it just wouldn’t turn away. Hanson is resident trainer for Arlis Justice, Camden, Ark., Hope Mitchell’s father, who owns Little Too Sly, by That Sly Cat. Gabe Reynolds, who drew first to work in the second set of the John Deere Finals, used Chris Hanson’s ride on Metallic Mandy in the first set, as his template. Metallic Moon, trained by Cody Frye, was purchased by the Pattons a year ago, after Reynolds and Sandy Patton watched Frye work the mare on several cows.